Penthouse For Sale in TAO Residences, Akumal – Our contemporary-styled, brand new luxury penthouse for Sale in Akumal, located in the heart of the Riviera Maya, offers a level of privacy you won’t find at any hotel. The penthouse features open plan living with an indoor stairway that leads to an expansive and totally private rooftop terrace fitted with a wet bar and fabulous hot-tub, offering complete privacy. 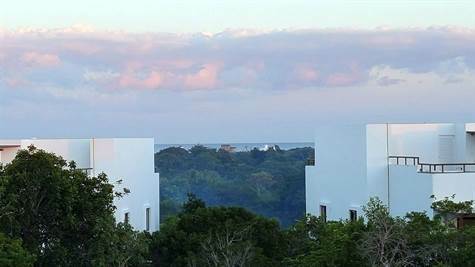 The rooftop terrace of this incredible Condo for Sale in Akumal has panoramic views of the jungle and the beautiful Caribbean Sea. Enjoy free WiFi and a living room with a big screen TV fitted with Sky Satellite TV. There are two bedrooms, each with its own en-suite bathroom. There is a large terrace off the living room with access available from the master bedroom. The laundry room contains a washer and dryer and there is also an electronic safe. It’s easy to get around, whether you hire a car or a golf cart, or simply use the resort transport provided that takes you to the beach and throughout the beautiful resorts within the Bahia Principe. You can walk to the Wellness Center where you can enjoy breakfast or lunch, yoga classes, and a fully equipped gym overlooking the lap pool. Lap pool and infinity pool. Robert Trent Jones designed golf course at discounted rates. Free access to the Bahia Principe Tulum and Bahia Principe Sian Ka’an resorts. Discounted day pass to Gran Bahia Principe Coba and Akumal resorts. 15% Discount at Bahia Spa at Sian Ka’an. Three gyms, five tennis courts and basketball courts. Enjoy live entertainment at Bahia Principe Tulum and Sian Ka’an resorts. Food and drink at more than 30 bars & 15 restaurants. Go all-inclusive with a $65 pass that includes breakfast, lunch, dinner and drinks all day. Dolphinarium, Scuba Diving and organized tours (Mayan Ruins, Turtles, Theme Parks and much more). Complimentary shuttles run throughout the Bahia community every few minutes to the 4 resorts, Golf Clubhouse, TAO Inspired Living, Hacienda Doña Isabel and the exclusive owner’s beach. There are also 4 theme parks within minutes of the penthouse: Xel-Ha, Xplor, Xcaret and Rio Secreto. Mayan ruins at Tulum are just 10 minutes away, and you can take a day trip to the ancient Mayan city of Chichen Itza, a World Heritage site. 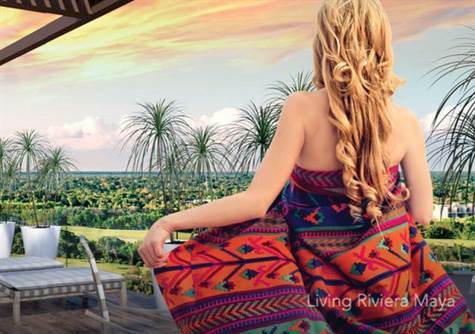 Contact Us today to schedule a showing and begin your new life in Paradise with Living Riviera Maya Real Estate. 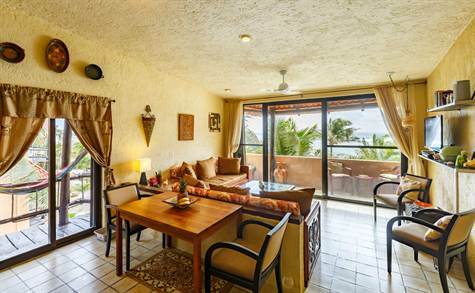 Beachfront, Cozumel – Renovated updated Junior one bedroom 2 bath penthouse condo for sale on the beach in Akumal. The Akumal condo for sale is actually located in Aventuras Akumal, a small quiet little subdivision on the beach just south of Akumal town. You will love it for the tranquility and simplicity of the area and privacy of the condo. It’s a Buena Onda, condo Onda Tranquila. You have got to see this to believe it for the location and the size of the condo for sale in Akumal. On a quiet secure private road with very limited traffic, this is the ultimate beach property to buy in all Riviera Maya. It is a hidden oasis. Fantastic opportunity to own the best beach real estate of Akumal at a fantastic price. Living room terrace is overlooking a large palm tree, direct to the beach, with an expansive view of the ocean. Open concept -Living room, Dining area, kitchen with 2 sliding glass doors overlooking the pool and the best bay in Akumal! Extra large master bedroom with large sliding glass doors opens to another large terrace. Comfy king size mattress with box spring on pedestal bed. Matching side tables desk with bookcase and dresser. Double sliders open to exterior terrazzo with wall seating. Glass patio table and four chairs. Main bath with quartz 6′ vanity, lots of storage below. Vessel above counter sink, bank of closets and storage outside double shower and toilet. The sand is special, high silica compound so it is never hot and wonderful for swimming in the Caribbean, perfect for beach strolling. Electric bill in this condo is an amazingly low 8 USD per month. ! Call now to find out more about this gorgeous 1 bedroom beach condo for sale ! Aventuras, Akumal – Magnificent 3 bedroom Akumal beach home for sale. If you want that quintessential piece of Riviera Maya Real Estate, this is it. On the very quiet private road, this home for sale in Akumal is set on the sandy beach of Aventuras Akumal beach. Elegant in its style and solidly built to endure the elements on the ocean in Riviera Maya, this home is worth viewing for anyone looking for a very special beach home for sale in Riviera Maya. 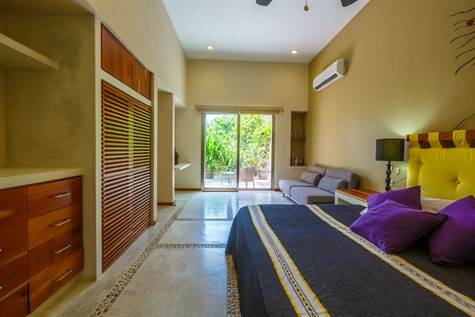 This Akumal home for sale features three (3) bedrooms and a den. There are two master bedrooms that face the Caribbean sea, with a large terrace. A third master bedroom faces the back terrace and garden. As you arrive to this magnificent home in Riviera Maya, lush gardens welcome you to a grand entrance. As soon as you enter the home, your breath is taken away by the amazing view to the ocean. Your eyes are captivated first by lovely blue patrician style swimming pool and terrace, across the sea lavender bushes, out the beach and the big blue ocean. Beautiful and functional kitchen faces the ocean, with all the amenities including granite countertops, custom woodwork cupboards, it has 2 sinks and breakfast bar for social entertaining. The kitchen looks out into the open plan living area, that sits under brick boveda ceilings. The living room also faces widely on to the pool deck and the ocean beyond, with retractable doors leading on to large deck and stunning pool overlooking the bay. It is Caribe style at it’s best, tastefully finished. It is everything you are looking for in a beach home for sale in Akumal. Imagine drinking champagne, and watching the turtles lay eggs all season long. You can be an eco friendly in your home on the beach in Akumal, and also enjoy the good life, knowing also you made a good investment in Rivera Maya. The features of the house are elegant and low maintenance. Bedrooms have polished cement floors, large en-suites bathrooms, large closets with safes, air conditioning and stainless steel fully retractable doors on to decks with outstanding views. Hurricane proof windows with hurricane shutters throughout for added security. This Akumal Beach House for sale has beautiful natural tropical hardwood throughout. Equipped laundry room with bathroom, pool & equipment rooms and covered parking on ground level. Rooftop palapa/entertaining area are outstanding for wide panoramic windswept views. Suitable for hanging out or partying or watching the sunrise, this roof top deck forms a very integral part of the experience in Casa Tres Amigos, Akumal. The 4th bedroom is currently being used as an office style combination extra room. It can be fitted out also for an extra bedroom and would be really lovely with view of back terrace looking onto the gardens. The back Yard at Casa Tres Amigos is fenced with automatic gate and is well landscaped with native plants to the area. Stainless steel hurricane shutters are nicely stored in pockets and easily moved and secured in place if ever needed. Call us for a private viewing of this outstanding beachfront home for sale in Akumal. Serious investors only please. This is a once in a life time to own an elegant and low maintenance beach home for sale in Akumal.